Students below the stairwell chant “We want Napolitano,” peering up to the second floor and demanding an audience with the UC president, who sat behind closed doors. Photo by Lluvia Moreno. 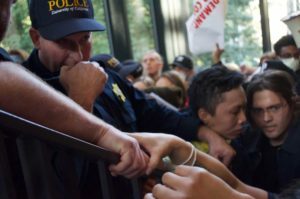 Surrounded by student activists pressing forward, third-year Jared Semana was at the front of the police line when UC Santa Cruz police officer Robert Locke-Paddon pushed his forearm against Semana’s neck, a move which caused Semana to believe he was losing consciousness. Leaning back, away from Locke-Paddon and onto fellow student activists, Semana ducked under the officer’s forearm, releasing himself from the officer. Two other students described similar experiences with UC police the same day in written testimonies provided to City on a Hill Press. 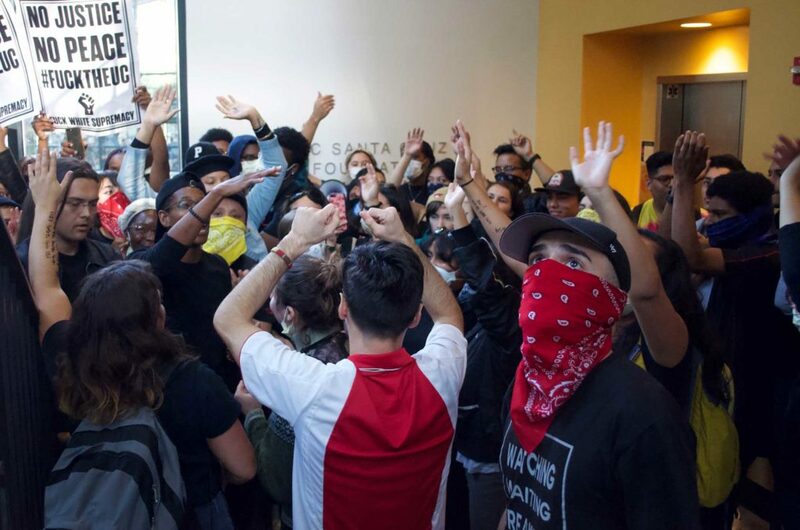 At 2:30 p.m., about 100 students dressed in black had channelled into the Colleges Nine and Ten Dining Hall doorway to confront UC President Janet Napolitano as she commenced the UCSC Chancellor Search Committee meeting on Nov. 16. UCSC police officer Robert Locke-Paddon confronts student activists, using his forearm to force a student back from the stairwell. Photo by Lluvia Moreno. 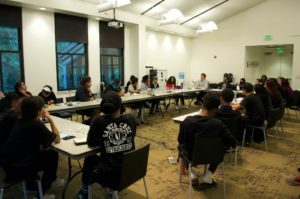 Student activists’ dissatisfaction with the UC’s history of diversity and representation prompted them to bypass UCSC administration and confront the highest level of the UC system. In the UC’s 2018 Accountability Report, the university mentioned challenges with issues of diversity and inclusion. It noted a “low enrollment of African American and American Indian undergraduate students” and a “graduation gap between underrepresented undergraduates and white and Asian undergraduates.” The same report also noted the frustration of historically underrepresented groups in the system’s undergraduate body. Student activists’ demands addressed issues concerning UC systemwide policies and programs, spanning from transportation and financial support to religion and the UC educational curriculum. Student activists believe the UC needs to incorporate more student voice in its decision-making processes, including the search for a new chancellor. In a day-long closed meeting, Napolitano and the UCSC Chancellor’s Search Committee assembled with alumni, donors and selected UCSC community members at the University Center above the Colleges Nine and Ten Dining Hall. There, on the second floor of the dining hall building, they discussed the replacement of Chancellor George Blumenthal, who is retiring at the end of the academic year. With Napolitano as its head, the Chancellor Search Advisory Committee totals 17 members. Of those, three are responsible for representing the UCSC student body — Student Union Assembly (SUA) President Ayo Banjo, vice president of shared governance for the Graduate Student Association Katie Hellier and UC Student Regent Devon Graves, a graduate student at UCLA. Since the morning of the meeting, students and staff noticed police presence around Colleges Nine and Ten. At the College Nine Namaste Lounge, police officers drew blinds and turned away students hoping to study there. Inside, about 10 police officers assigned to the meeting congregated. The university supplemented the UCSC police force with officers outside campus, including officers from UC Berkeley and San Francisco campuses. UCSC Chief of Police Nader Oweis did not comment on particular interactions but said students with any allegations against officers should bring them to his office. For most details, Oweis referred City on a Hill Press to Scott Hernandez-Jason, UCSC’s director of media relations. Hernandez-Jason emailed his general understanding of the demonstration, but did not specify information surrounding security for the meeting. He also did not specify the total number of police officers present. Within minutes of arriving at Colleges Nine and Ten, the student demonstrators entered the building. Their necks craned as they peered into the second floor. “Why are you hiding, why are you scared,” they chanted with their hands up, some looking officers square in the face. By 2:50 p.m., about 20 minutes into the protest, students attempted to make their way up the stairwell to meet the committee. Officers pushed students back, with at least one using his baton to do so. 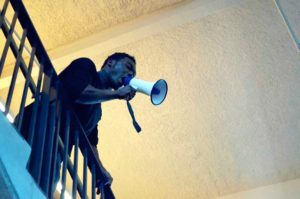 Within another 10 minutes, students advanced and pushed past the officers up the second floor of the stairwell, some gripping the staircase railing while others climbed over it, attempting to reach the meeting room. Alerted by the student-police interaction outside, UC Office of the President (UCOP) staff members and UC police officers prepared for Napolitano’s and the committee’s exits, said Devon Graves, who was in the room at the time. Escorted by three officers, at 3:05 p.m. Napolitano left through the back entrance of the center, walking toward a black car parked next to the building. She declined an on-site interview with City on a Hill Press. Other committee members followed, filing onto a campus shuttle bus. They also declined to comment on the demonstration at the time. SUA President Ayo Banjo addresses student organizers and announces they will be allowed to ascend the stairs and read their demands at the meeting in the Alumni Room at the University Center. Back inside, minutes before Napolitano’s exit, Ayo Banjo left the committee meeting and addressed students in a speech. Student activists handed him their megaphone so he could be heard. He informed the students they would be allowed to read their demands to Napolitano and the committee. The officers then separated and students ascended the stairs. However, when they arrived at the meeting room, Napolitano and the committee members had already left the building, dodging student demonstrators. “We just want our voices heard!” a frustrated student shouted from the crowd in the deserted meeting room. Half-empty cups strewn on tables, untucked chairs and nametags of the committee members left awry were all remaining of the committee. City on a Hill Press could not confirm if Banjo was still in the Alumni Association Room when the evacuation order was made. Banjo denied any direct interview with City on a Hill Press. In the minutes after discovering Napolitano and the committee deserted the building, students called on the UC president to return. With few remaining UC administrators in the building, students addressed their frustration with the president’s departure to Jean-Marie Scott, Associate Vice Chancellor of Risk & Safety Services, and Jaye Padgett, the Vice Provost for the Division of Student Success, a division focused on the retention of UCSC students. Students asked Padgett to call Napolitano. 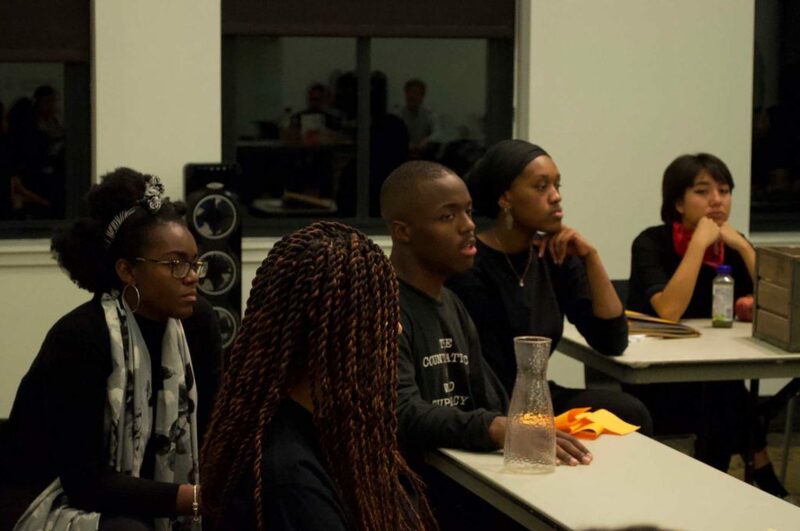 Students address issues with the student body’s underrepresentation of historically marginalized groups and the administration’s insufficient attempts at student outreach. After Napolitano’s exit, students explained their demands and negotiated with Padgett and Dean of Students Garrett Naiman in a town hall — the two acted as messengers for the students and Napolitano. Students negotiated for a face-to-face meeting with the UC president and legal protection from the demonstration, recounting personal experiences with the UC to the two intermediaries. Students meet in a town hall with Jaye Padgett and Garrett Naiman after the demonstration. They negotiate for a face-to-face meeting with Napolitano and legal protection from the UC. “I am an Indigenous student, and there are practically no other Indigenous students. I can count the number of Indigenous students on my hand,” one student said at the meeting, refering to the issue of diversity and retention on campus. Another student commented on problems of racial and cultural sensitivity, describing their experience as a person of color at UCSC. “We can walk in and know which space is a white space and a Black space,” they said. At the end of the two-hour meeting, neither Naiman nor Padgett could guarantee legal protection for all students involved in the demonstration activity. But in an email sent on Nov. 19 to student demonstrators present at the meeting, Padgett said he would advocate against potential legal action taken against students, but only regarding what he had observed in the post-demonstration meeting. Concerning a meeting with Napolitano, Naiman and Padgett relayed her compromise — a video conference on Dec. 3 with a maximum of seven students and an in-person meeting with the UCOP vice president of student affairs. The video call was negotiated separately from the committee’s second advisory meeting, also scheduled for Dec. 3. Though students saw the compromise as a step in the right direction, they were disappointed in Napolitano for not meeting with students in person. In an email sent to UCSC undergraduates on Nov. 21, five days after the demonstration, the UCSC Chancellor’s Office announced the Dec. 3 advisory meeting as open to all students. Additional reporting by Chloe Reynolds.